Towards the end of this year’s stay on Bird Island I was able to photograph a Sooty Tern in the colony with unusual (compared with the vast majority of birds in the colony) plumage. Instead of having a clear-cut line between the white forehead and black cap on the head, this bird had a gradation of white flecks extending into the black cap. In addition, instead of the back being uniform sooty-black as in adults breeding in the colony, the upper back (or mantle) feathers of this individual had pale whitish feather edges, producing a pale barring effect. In the 1990s and early 2000s, we used to see several birds like this each year on both Bird Island and Desnoeufs Island, usually on the outskirts of the breeding areas. In those years we noticed another characteristic of these birds – their voices were much higher-pitched than those of breeding adults; in fact, they were very similar to the calls of recently-fledged juveniles as they communicate with their parents when flying over the colony during their first ventures into the air. Their high-pitched calls led me to believe that these birds were young, possibly a year old, and had not yet moulted into full adult plumage and their larynxes had not yet developed the ability to produce the deeper, more characteristic calls of older birds. Following several years in which we have not seen any of these supposed youngsters it came as something of a surprise to find this bird in the nesting area. The absence of these birds in recent years could be a concern, however, if it signals a reduction in the number of young potential recruits surviving to contribute to enter the breeding population. 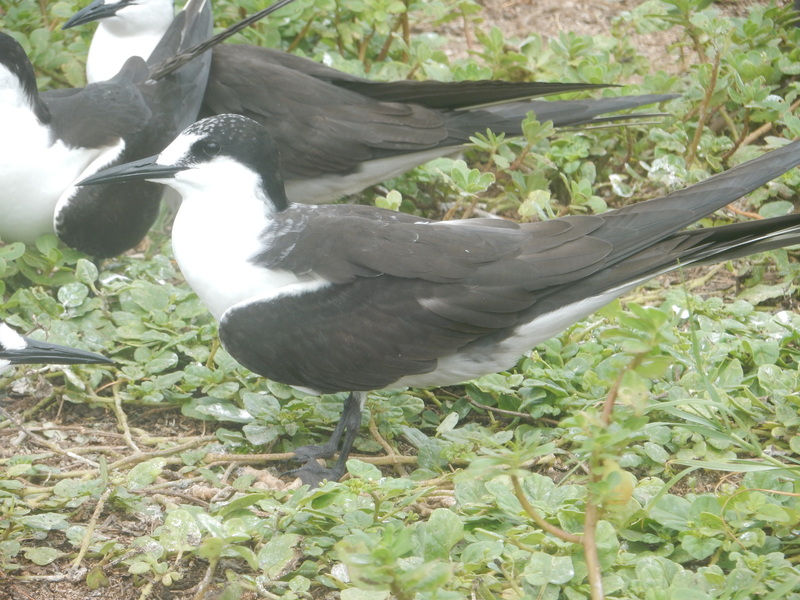 We know from studies of ringed birds that Sooty Terns do not normally begin breeding until five years old and that during this period of immaturity they suffer heavy mortality. The early days of their flying lives and the gaining of independence from their parents, when the youngsters have to learn where to find food and how to catch it, must be a difficult phase of their lives. Failure of breeding colonies to produce sufficient young birds, or oceanic changes that increase their mortality at sea, could in the long term lead to declines in the breeding colonies of Seychelles’ most numerous seabird.